There has been a whole lot of mischief going on around here. Ever since Gizmo found out he’s staying here for good he’s been trying to take over the place. He even thinks he owns stuff that’s mine. Like my dog jail kennel. So I decided I’d better do something about it. Gizmo, you’d better get out of there. That’s mine, I tell you. Mine! You’re allowed all kinds of places that I can’t go – like the couch and my person’s bed. And you want those places and my spot too. Why don’t you go find a place to hide like good cats do? 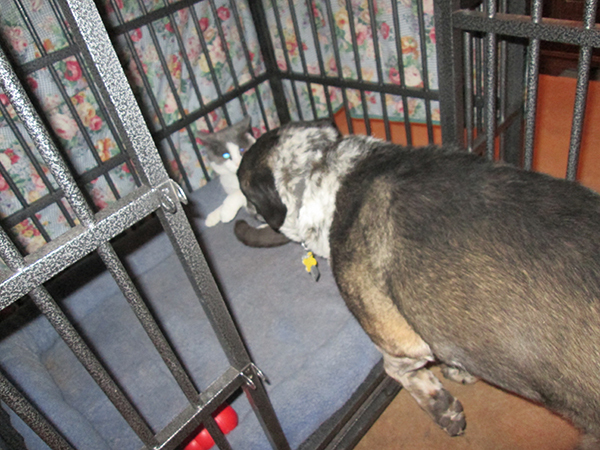 Whatever you do – get out of my kennel! Gizmo wasn’t about to leave so I decided I had to do something about it. He got so mad at me that his eyes turned bright blue. And nothing I did was going to get him out of my kennel. So I locked him in. 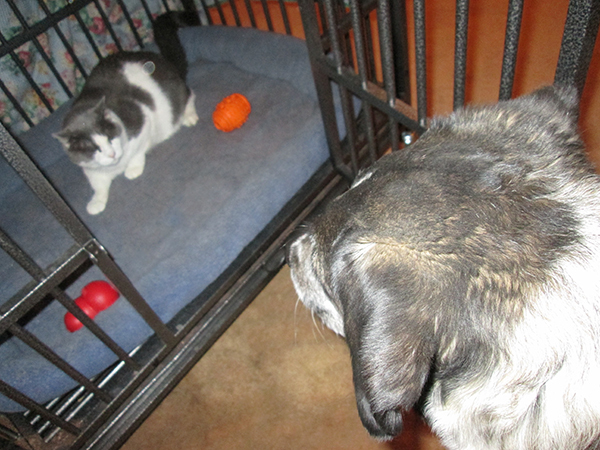 Marina, I wish I could say that Gizmo has been behaving since I locked him in my kennel – but he escaped. I think my person let him out. That Gizmo needs to learn his place! You sure taught him a lesson Bongo. Kimberly, I don’t think I taught him a good enough lesson. I need to lock him in there again. WOL! Good fur you Bongo! Thanks Ku. A dog’s got to do what a dog’s got to do. Don’t,t blame you Bongo what a cheeky cat. Now Scratchy has a partner in crime and it sounds as though he is claiming his rights. Patrecia, I think Gizmo is even worse than Scratchy. What to do, what to do? Patrecia, I’m on my way. At least the dogs outnumber the cats at your house. YOUR TOY!!!!!!!! Is in there… NO get the cat OUT!!!!!!!!!!!! Fredrieka, thanks for the warning. I’d better get my toys and then lock Gizmo back in there again. Locking him in might teach him a lesson. I’m sure when you open the door he’ll be desperate to get out, never to venture into Bongo’s kennel again! Pigs, I wish that were true. My person let him out and he keeps going back in there. He’s in there sleeping right now. Little Binky, Gizmo escaped. And he’s trying to take over the house. Oh, no! Gizmo thinks he’s a dog! Just trying to copy his hero: You, Bongo? Karen, I wish that were true. I think he’s trying to take over this place. Cats are so stretchy….like they claim everything a single hair touches! Stare Gizmo down! Karen, I’m afraid if I tried to stare Gizmo down he stretch those claws of his and try to get me. That is one stubborn kitty cat. 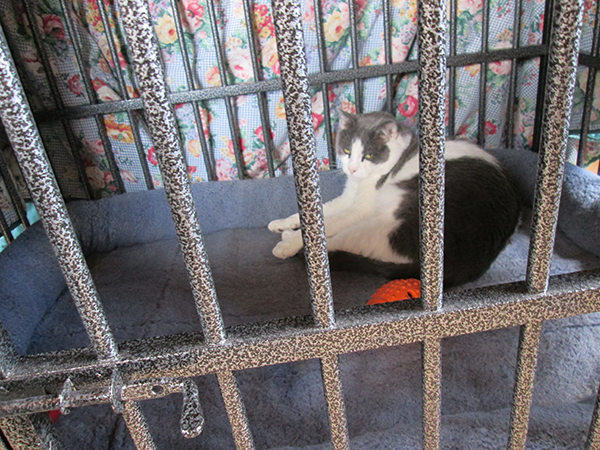 Now he can sleep in dog jail, and when it gets dark, you can sneak into bed and pretend to be him! Good luck. Great idea Cupcake. My person will never know the difference. Jen, it’s a comfy place to sleep. If I want to go sleep in there I’m afraid I’ll have to kick Gizmo out. And he’s got claws. Gizmo’s trying to take over this place. I think I’ll leave him locked up there. Thanks for stopping by and commenting. A dog has to do do what a dog has to do! You can’t let a cat get the upper paw! You are so right M.K. I’ve got to stay in control around here. Hedid give you the kitty lazer eyes for sure! Marty, I don’t know how he did that. Nel, I’d better not do it like I do outside, but maybe if I rub on everything the cats won’t want to hang around. Dalton, I hope he learns a few things but I’m not so sure. Gizmo looks very comfy in his …Oops! in YOUR dog jail! seems to be very relaxed….Oh no! now he is glaring at you, Bongo! What to do what to do……. Kevin, Gizmo thinks he can take over this place. He’s wrong! He’s wrong! This was my house first. Haha-for you Bongo! that cat was really asking for it…. 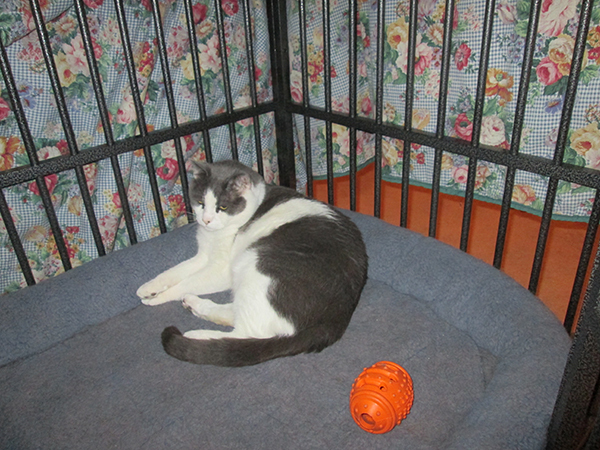 I think I’ll keep Gizmo in there forever and have my person get me a new comfy bed so I can sleep somewhere else. Snoopy, I might need to lock him in there permanently.